The early detection project in the laboratory of Cheng Wang, PhD, aims to discover key alterations - during malignant transformation of ovarian and fallopian tube cells. With key support from Colleen's Dream Foundation, Mass General researcher Cheng Wang, PhD, aims to improve the chances of early detection and treatment of ovarian cancer. Despite advances in the early identification of some cancers, the ability to detect ovarian cancer in its early stages continues to elude researchers. 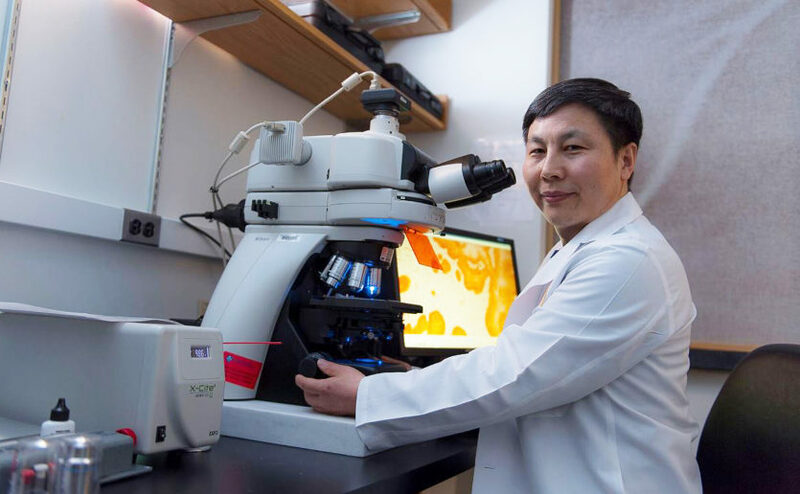 Cheng Wang, PhD, a researcher and principal investigator at Massachusetts General Hospital’s Vincent Center for Reproductive Biology (VCRB), is determined to change that. Ovarian high grade serous carcinoma (HGSOC) accounts for 70 percent of epithelial ovarian cancer cases, making it the most aggressive subtype. While a majority of women are diagnosed during the late stages of the HGSOC, if it is diagnosed early and the cancer is confined, the disease is highly curable. The early detection project in Dr. Wang’s laboratory aims to discover key alterations – during malignant transformation of ovarian and fallopian tube cells. These alterations could be used as biomarkers to find the cancerous cells at very early stages and ultimately predict and prevent its spread. Wang – who established his new lab in the VCRB in July 2017 – is examining what leads to the genetic or genomic alterations of the fallopian tube lining cells; why cells with these alterations become transformed, and how the transformed cells colonized in the ovary and surrounding tissues to form high grade serous ovarian cancers. “I want to know what happens behind the disease,” he says. Before joining Mass General, Dr. Wang received a grant from Colleen’s Dream Foundation – a non-profit foundation that raises awareness for ovarian cancer and supports early-detection research. The funding not only supported his research but also provided him the opportunity to spend quality time with those whose lives have been touched by ovarian cancer, including the Kenkel family from Harlan, Iowa, active fundraisers and supporters of Colleen’s Dream Foundation. The researcher says a visit to the Kenkel’s home allowed him to establish a bond with the family who had lost their mother to ovarian cancer – and it further cemented the laboratory’s dedication to the field. Colleen’s Dream Foundation recently awarded Dr. Wang an additional grant to continue his research in the hopes of improving the chances of early detection and treatment. To learn about how you can support Dr. Wang’s research, please contact us. Your gift will help advance efforts to detect and treat ovarian cancer earlier.